50 percent Physician/Store Wholesale Discount. UltraFINE product is only sold at the retail price. "I strongly recommend you sell ultrafine powder labeled as world finest. There is no problem in using DSM fine powder, but there is clear difference when you go mega dose with ultra-fine powder reaching more that 10 g a day. You can sell the fine powder or crystals, but they are second or third grade (larger) at least in terms of size of the granules of ascorbic acid. Those differences result in the difference in bowel tolerance doses, which Dr. Robert Cathcart, III, insisted as the ideal dose of oral megadose Vitamin C therapy to individuals." - Byeong Keun Ha, M.D., Ph.D.
Or you may place orders and ask questions by phone: 800-894-9025 (USA). Your purchase supports the nonprofit Foundation. 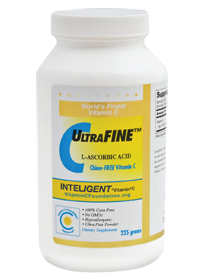 UltraFINE™ Vitamin C is a unique ultrafine L-ascorbic acid powder that dissolves almost instantly in water and has almost no taste. Doctors familiar with this product tell us that the DSM ultra-fine grade of powder is better absorbed and more effective than other vitamin C powders. 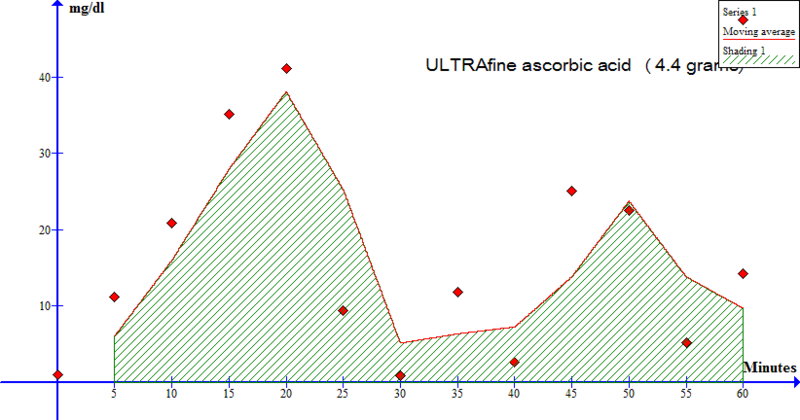 Physicians prescribe UltraFINE™ to achieve high ascorbic acid blood levels. Ascorbic acid is vitamin C. Humans lack the capacity to make this molecule and must obtain it in their diet. Pure ascorbic acid is bio-identical to the vitamin C molecules that are made endogenously by most plants and animals. Generally, vitamin C can be purchased as either L-Ascorbic acid, a weak acid, or as Sodium L-Ascorbate. Ascorbic acid is the most common form of the vitamin and was used and recommended for oral consumption by Linus Pauling. The late vitamin C expert Robert Cathcart III, MD, prescribed high-doses of vitamin C to thousands of patients. Doctor Cathcart found oral ascorbic acid to be twice as potent as sodium ascorbate and other ascorbate forms for many therapeutic applications. 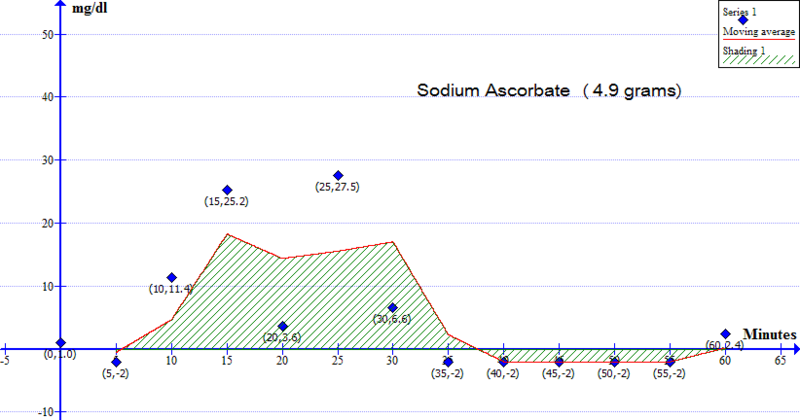 Note: both both liposomal and intravenous vitamin C are administered as sodium ascorbates. UltraFINE™ Vitamin C is not manufactured in China. Why don't other vitamin C products tell you where they were manufactured? Because almost all vitamin C products on the market are made from inexpensive Chinese vitamin C! The new UltraFINE™ Vitamin C product is made entirely from highest-grade vitamin C manufactured in Europe. We use the finest powder (ultra-fine) of the highest-quality product on the market which has been trademarked as Quali-C***™ manufactured by DSM Nutritional products. DSM Certified free of Genetically Modified Organisms (GMOs). AUTOSHIP (regular repeat automaticc orders at wholesale) . The products are the same, whether tyou order the regular one-time (retail) product, or the much lower priced product when you subscribe to a recurring AUTOSHIP. Note: You may mix and match retail and autoship products in the same order. Order Vitamin C Products on at our Lowest Price on Autoship! For the lowest pricing on regular one-time orders, please note the Quantity Discount table in the product description. EASY CANCEL : Online, Direct (My Account), email or phone. INTELIGENT*Vitamin*C Inc DBA VitaminCFoundation.COM supports the Vitamin C Foundation. 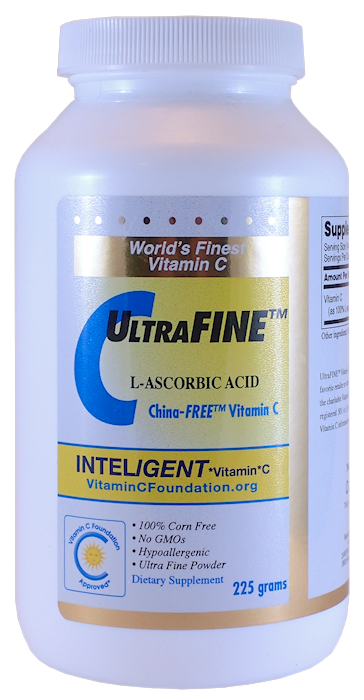 China-FREE™ UltraFINE™ Vitamin C is guaranteed not to contain vitamin C that is made in China. We are the profit company that markets VITAMIN C FOUNDATION approved products. A portion of the proceeds from the sale of Vitamin C Foundation approved® fine vitamin C powders is used to fund the NonProfit 501(c)(3) Vitamin C Foundation VitaminCFoundation.ORG research and activities. 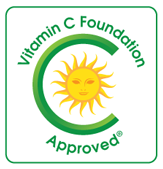 Vitamin C Foundation Approved® is a registered trademark of the Vitamin C Foundation. Quali-C® is a registered trademark of DSM Nutritional Products. True-Liposomal™ is a trademark of The Vitamin C Foundation. Cardio-C™; is a trademark of Inteligent*Vitamin*C Inc. Consider making a contribution to the nonprofit Vitamin C Foundation at the same time you place your order. As the Foundation is a recognized 501(c)(3), your donations are tax-deductible within the guidelines of U.S. law. Proceeds are used to fund this web site and the Foundation's initiatives.